Pascale Petit was one of the guests on Radio 3’s The Verb on 19 October. Pascale spoke about the Amazon rainforest both real and metaphorical. 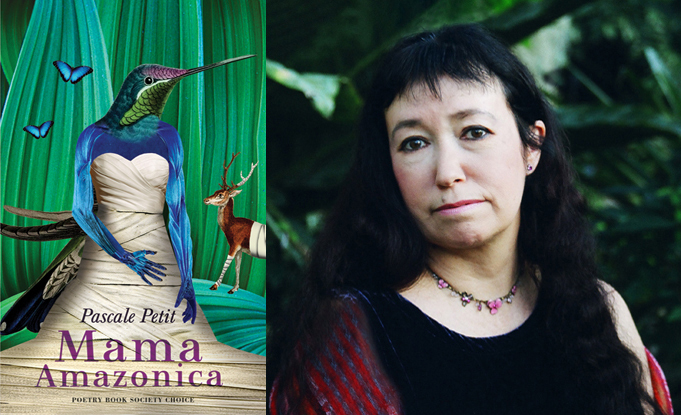 Her RSL Ondaatje Prize-winning collection Mama Amazonica is set in the Amazon rainforest, and she uses the forest to express her experience of her mother’s mental illness. Pascale spoke about her four trips to the Peruvian rainforest. She read her poems ‘Jaguar Girl’, ‘Rainforest in the Sleep Room’ and ‘Mama Oceana’. She also read ‘Black Caiman with Butterflies’ as an extra poem for the podcast. All are from her 7th collection Mama Amazonica. Click here to listen. Pascale features from 31:20. Downloadable as a podcast - Pascale reads an extra poem at the end of the podcast. Danne Jobin interviews Pascale Petit, winner of the 2018 RSL Ondaatje Prize and co-founder of the Poetry School, about rainforests, mothers and fathers, and trauma. Click here to read. Pascale Petit spoke to Tishani Doshi about Mama Amazonica for The Hindu. Read the feature review here. An interview with Pascale Petit is included in the Summer 2018 issue of The RSL Review magazine. She was speaking to Eva Hoffman about winning the RSL Ondaatje Prize 2018. The three-page feature was illustrated with a photo of Pascale next to Grayson Perry at the award ceremony. Eva Hoffman was one of the three judges of the award. While Pascale was in Belgrade for the poetry festival in May 2018 she gave an interview to the magazine Rhizome. Read the interview here. Mama Amazonica was also shortlisted for the Roehampton Prize 2018, along with fellow Bloodaxe poet Ahren Warner's third collection of poems Hello. Your promise has been extracted. Pascale was filmed speaking to Roehampton judge Nathalie Teitler about her 25-year obsession with the Amazon rainforest here. Mama Amazonica is set in a psychiatric ward and in the Amazonian rainforest, an asylum for animals on the brink of extinction. The book tells the story of Pascale Petit’s mentally ill mother and the consequences of abuse, as well as celebrating the beauty of the wild, whether in the mind or the natural world. It evokes the spirit of the Peruvian Amazon, informed by two trips Pascale made to the region in 2016. Photographs she took there are included in an interview with Pascale Petit in the March 2018 issue of The Compass magazine here. For details of Pascale Petit's forthcoming readings, click here.